Itâ€™s been an exciting seven months for me since I started work here at the Upper Valley Land Trust. Iâ€™ve gotten to visit dozens of special places, walk through working farms and forests, and meet so many amazing, passionate, dedicated people who call the Upper Valley home. Iâ€™m lucky to be here. One thing that has always interested me is sense of place. It is where community, economy, natural history, and cultural history converge. New England is steeped in a rich cultural history which has left windows into the past spread out across our landscape. We see this history every day in the stone walls which make up our property boundaries, in the old villages and homes we live and work in, and in the farms and forests that are characteristic to our region. Sense of place is what we strive to protect. An old cellar hole near the Leavitt Hill Conservation Area. Recently, my fellow steward, Jason, and I ventured out in Grantham , New Hampshire, in preparation for a trip weâ€™re hosting on January 4th. 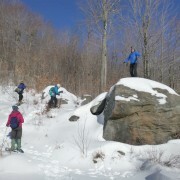 We traveled through two properties that the Land Trust owns and manages, the Leavitt Hill Conservation Area and Snow Mountain. 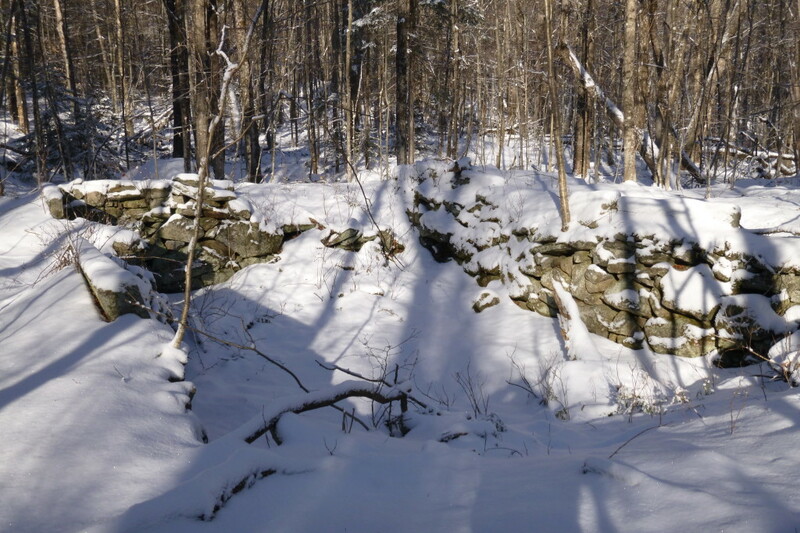 Leavitt Hill Conservation Area, a 90 acre property acquired by UVLT in 2011 with the help of the Town of Grantham, is host to a couple of old foundations, or cellar holes as we like to call them. In fact, there are a number of cellar holes located near the property along the historic Leavitt Hill Road. The road is named after Nathaniel Leavitt who first settled in this area in the 1790â€™s and whose original homestead can still be found nearby. This once thriving community, which at one point had 53 Leavitt children enrolled in the school house nearby the Leavitt Hill Conservation Area, was abandoned in the late 19th century. We can only guess what reasons or opportunities pushed the Leavitts and their neighbors to move on, but like many hilltop communities in New England at this time abandonment was a trend which began when fathers and brothers didnâ€™t return home from the battlefields of the Civil War and continued with the promise of fertile land out west to whoever could stake a claim. Leavitt Pond near an area once home to a thriving hilltop community. Snow Mountain, a 400 acre property straddling the towns of Grantham, Plainfield, and Enfield, as well as Sullivan and Grafton Counties, is host to extraordinary wildlife habitat. There are at least four wetlands complexes on the property, all in different stages of succession driven by beaver activity. The property also hosts exceptional bear habitat. We were constantly finding beech trees with new and old claw marks on their boles, and bent over branches in the canopy called â€˜bear nestsâ€™. We even found a number of fresh tracks during this frigid mid-December exploration. 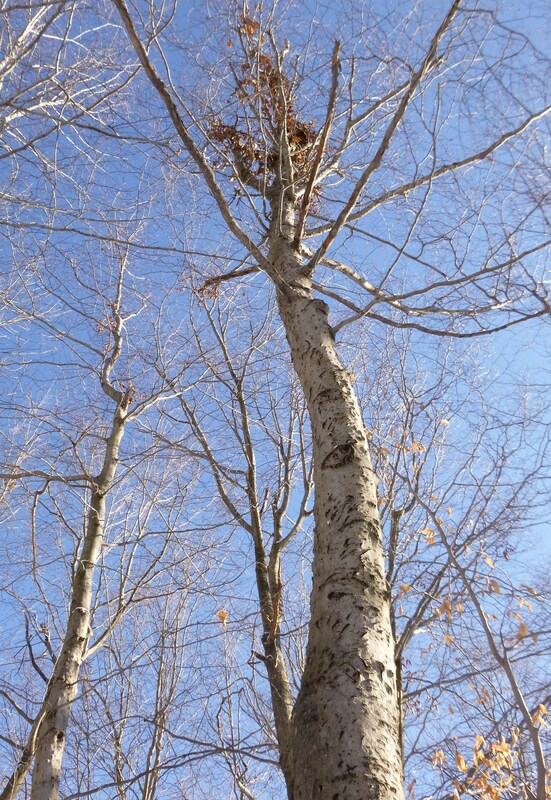 A scarred beech tree with a bear nest in the canopy. 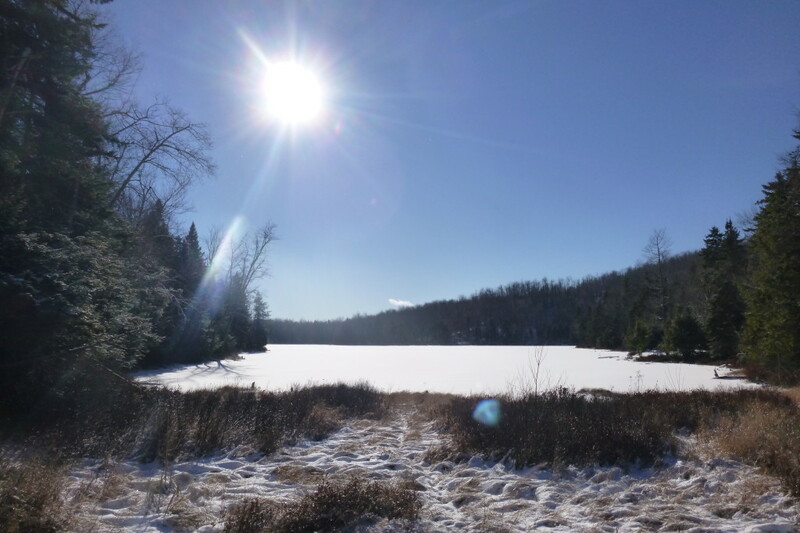 Snow Mountain and the Leavitt Hill Conservation Area lie within large tract of undeveloped and unfragmented forestland, including the 31 acre UVLT conserved Lucius Smith Lot, the 445 acre Grantham Town Forest, and the 820 acre Flewelling Sherwood Forest. These large tracts of undeveloped land are crucial for the wildlife in our region. Black bear, bobcat, and moose can require home ranges of 1,000-11,000 acres, depending on habitat quality. Conserving properties like these help guarantee that our wildlife will have the room to roam for generations, and that we will have wild places in our backyard to visit. Iâ€™m no stranger to the natural and cultural history of New England, but I still find myself amazed at the fact that an area like Leavitt Hill, now home to many of our large, charismatic wildlife species, was once home to a thriving human community. Finding and interpreting the stories and history of our region while Iâ€™m out in the field is part of what makes this job so rewarding. Every little bit of history, every patch that I can fill in on the mosaic of our landscape, adds to my sense of place. This is our place. Weâ€™re lucky to be here.